We're going to go out on a limb here and guess that you like pizza. Pizza is a gift from heaven, and few things hit the spot like a warm gooey cheesy slice of it. In case your week is dragging and you need a little extra motivation to get through hump day, here are just 17 mouthwatering pizza gifs, because why not? 1. Just look at how beautifully this pizza pulls apart! 2. The way this cheese crackles and bubbles is just too much for us. 3. That glistening pepperoni. That stretchy wall of cheese. So much yes. 4. What’s the point of even slicing it when you’re going to eat the whole thing anyway? A beautiful waste of energy. 5. 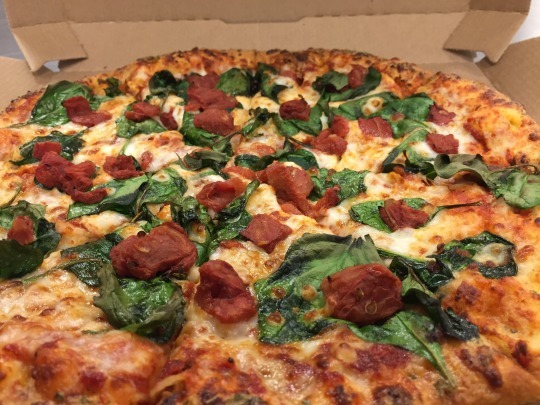 Full disclosure: we could watch this pizza spin for hours, and we're not ashamed. 6. Veggies have never looked better than when they sit on a gorgeous nest of stretchy cheese. 7. This pie is speaking to us. Have another slice, it says. 9. We could never forget the perfection that is deep dish. 10. Feel free to meditate on this one and really contemplate the meaning of life. Hint: it’s pizza. 12. Beauty comes in all shapes and sizes. 13. It’s true…I don’t have a type. 14. Go ahead. Have a slice. 15. Make sure you grab some for later. 16. Get one for the road. 17. Because there's really only one logical step forward from this point.